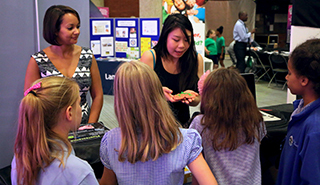 The centre took part in "Technopop: Science, Sports and the Human Body", a free festival for children and teenagers aged 6 to 19 that took place in Brixton, London, between 7th-10th July. The student organizer of the centre's contribution to this event, Adna Dumitrescu, takes up the story. "As with most academic institutions, the research done here at the MRC Centre for Developmental Neurobiology is financed mainly through a patchwork of public funding from research councils and charitable organizations. This support allows us to push the boundaries of scientific knowledge concerning brain development - one experiment, discovery, and research publication at a time. These findings slowly but surely trickle down and benefit society at large. A more immediate and positive impact, however, can be achieved by engaging with the wider public about science and, specifically, our research. So this is what we did with Technopop. "Why this particular event? I was drawn towards it because of a slight personal bias: I have lived in Brixton for the last 5 years and had the chance to witness that, while parts of it are indeed ‘up and coming’, it is still overall one of the neighbourhoods with the highest poverty indicators in London. This together with the fact that local schools have some of the lowest transition rates to University, and that science is usually not a popular study subject, motivated us to organise a stand about our work. "The idea was to put something on display that was simple but essential for our experiments, pretty to look at and exciting for our target group of children who were actually not that into science. So through a great team effort of 36 contributors, we came up with a stand called ‘Glow in the dark science at KCL’, aimed at explaining some of the exciting applications of fluorescence in biomedical research. "How did we do this? If a photo is worth a thousand words, watching a live fluorescent creature down a microscope must be the equivalent of a whole encyclopaedia. So we set up three microscopes, one of which was a generous loan from Zeiss, and brought over some of the model systems that we use in the lab: zebrafish embryos with green beating hearts, fly larvae with glowing green muscles and worms with fluorescent throats. We also put together a mock operating table at which children were able to remove fluorescent ‘cancer cells’ from play dough models of hearts, lungs and brains, simulating some of the cutting edge techniques currently being developed in several medical trials. "What did our audience think? Since it was the first time we were doing this, we were not sure whether “children will really be that keen on computers and microscopes”, as Ankur Perry (BBSRC LIDo PhD student in Robert Hindges’ laboratory and one of our stall presenters) put it. It turned out the exact opposite happened. Children would approach the microscope, struggle and squint for a couple of seconds to find the right way to ‘see’, then immediately start smiling, followed by exclaiming a big “Oh my days!”, “This is not real!” or a simple “Whooa!”. It was amazing to witness this happening over and over again. To be completely honest, we also had some “This is gross!” reactions when watching fly larvae crawl about in a petri dish, but this was quickly followed by a “Can I see it again?” request. "The mock operating table was unexpectedly popular, attracting children of a wide range of ages, from 6 to 14, all perplexed by learning a completely new motor skill as they had to coordinate their hands while looking at a computer screen. Have a look at the photos below and you will be able to see the high level of concentration achieved by some of them. This being said, some of our especially young ‘doctors’ expressed some reservations as to whether their play dough ‘patient’ would actually survive their rough surgical procedures. 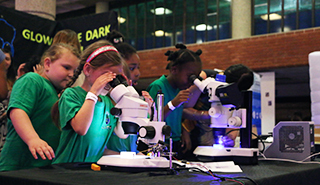 "Over the three days of the festival, we had a lot of fun showing children some of the tools we use for our own experiments here in the lab, and we think that we have achieved our initial goal as Rachel Jackson (Postdoctoral researcher in Juan Burrone’s laboratory, stall organizer and presenter), remembers one girl said that “science was really boring until I showed her a fluorescent zebrafish which she thought was amazing!”. 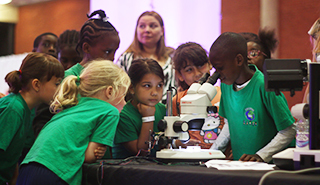 The children’s excitement was contagious and gratifying and as every PhD student or postdoc that has spent a whole day working in a dark microscope room can tell you, having your passion for science reignited is no small reward. "What’s next? 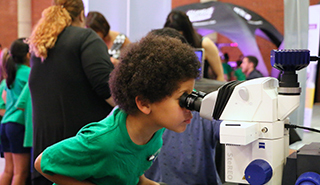 There are some rumours going round our Centre that we might repeat this at the next Technopop event which will take place in Croydon in the autumn, so stay tuned, visit our website and follow us on Twitter @dev_neuro, for more details. Or even better: get in touch if you would like us to come to your school with some of our microscopes and glow in the dark experiments. "I was only able to pull off organising this event as 36 generous people from the MRC CDN (and beyond) replied to my call for help. So I would like to thank them for all their hard work, advice and generous donations of equipment and time, as well as the Centre for providing funding for this activity. "The wonderful Fluorescence Stall volunteers and organizers, all researchers from the MRC CDN: Fatima Abbas, Triona Fielding, Caroline Formstone, Elisa Galliano, Patricia Gordon, Athene Knufer, Rachel Jackson, Ting Kwok, Maureen Liu, Ankur Perry, Mark Rigby, Thomas Ryan, Carly Schott and Katherine Trevers. And also the Group Leaders that encouraged them to spend some time at this event: Laura Andreae, Juan Burrone, QueeLim Ch'ng, Sarah Guthrie, Matthew Grubb, Corinne Houart, Robert Hindges, Martin Meyer, Richard Wingate. "Paul Brown, Richard Meyers and Brian Crockford (Zeiss Microscopes), Danny Mackay and Stephen Franey, Darren Byrne and Sarah Kemlo (King's College London), for lending us equipment. As well Simon Hughes, Tapan Pipalia, Dee Duvaraka, Darren Williams, Catalina Rodriquez, Will Constance, Queelim Ch'ng for lending us the model systems we used. "Grant Wray, Winnie Wefelmeyer and Andrew Lowe for technical support. Dickie Davies, Ovidiu Antonie and Johannes Hellwig for helping us with the logistics, set up and transport and Thea Dumitrescu for photographing the event.